My love and passion for whitetails is hard to explain. And for any of my non-hunting friends, it’s even harder to understand. While I spend many hours chasing them throughout the fall and winter months, I enjoy observing them, and Lord knows I can’t stand to see them suffer. Trying to extrapolate on that to friends usually gets me a few wrinkled brows. Yes, I kill deer. But, yes, I also respect them plenty enough to get a knot in my oversized belly each time I see one suffering. I get that way about a lot of animals. 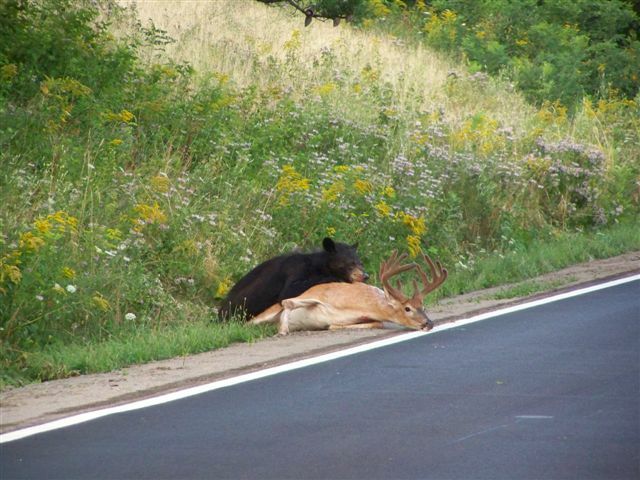 My friend, Greg, passed along a recent photo series from Deer & Deer Hunting’s chat forum (Click here to see the photos. WARNING: Graphic). The series, titled “Bear Attacks, Eats Buck” is a voyeuristic peek at what happens in nature. A whitetail buck, apparently injured in what was likely an encounter with a vehicle, makes very little effort to get away from a fortuitous black bear. The buck, which appears to have a broken leg among his injuries in the first shot, dies a painful death. The bear feasts. That part I understand and can accept. But what is challenging for me to figure out is that this didn’t happen quite that way. There was at least one other subject in attendance. While what we don’t have are hard facts, the photos were apparently taken by a ranger. Most rangers are armed with handguns on their hips. If this one was armed, I can’t figure out why he or she wouldn’t have “finished the events” sooner by putting the buck out of its misery. Again, it’s hard to consider any of the information given on the multiple website descriptions of the occurrence as fact, but hopefully this wasn’t a ranger opting for dramatic photos over a good deed. Thus I ask … what would you do if you stumbled upon this situation? More specifically, if you came on this scene with a firearm at your disposal? I know what I would have done. This entry was posted on Sunday, August 29th, 2010 at 5:53 pm	and tagged with bear kills deer, Hunting and posted in 2010, General Tales. You can follow any responses to this entry through the RSS 2.0 feed. Great post, great question. I won’t comment on the speculation as to whether or not an armed ranger took these photos, but if I were armed and stumbled into this situation, I think I’d reluctantly let nature take its course. I can’t stand to see animals suffer, but I also have to consider the legal ramifications of taking an animal out of season. The DEC here in N.Y. doesn’t mess around and I wouldn’t want to risk my own hunting status. I’d definitely call the local game officials, or 911, to report the incident, though. If I got the OK to end the suffering, I wouldn’t hesitate. As beautiful as nature can be, we have to remember that it can equally as cruel. You continue on your way down the road and you allow nature to run it’s course.